Blondie and Brownie: A Schne-What? A Schne-Who? A schnecken? What? What is this?! Those were my thoughts after hearing the list of available Balthazar pastry on hand at my neighborhood/weekend coffee shop, Cup. Apparently, there is one German Jewish pastry I do not know well, I don't know it all! Cup on Norman is a cute little coffee shop that, from what I gather, usually gets pastries from their next door neighbor, Halcyon Gourmet, but they also get some special pastry from iconic Balthazar. Even though I don't typically get morning pastry, I save that treat for vacations, every now and then I want a little something with my coffee. 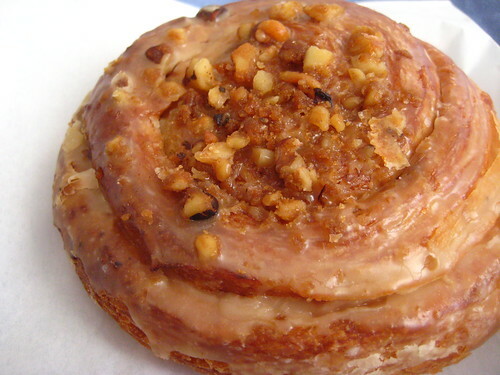 This particular time, it was an afternoon coffee, so the maple walnut schnecken in question had been out of the oven for many hours. Schneckens are a cousin of rugelach, a main difference being that the schnecken are made with sour cream, not cream cheese. They're often described as Sticky German Cinnamon Buns, the name means snail in German, and are quite popular around Philly and Baltimore (two cities I've never visited.) My Walnut Maple Schnecken reminded me of a maple cinnamon bun crossed with rugelach; the dough is flaky, but denser than I'm used to in pastry. I would definitely love to taste one hot out of the oven, and will be trying any schnecken I come across. Hmmm.. I am from Philly and don't recall seeing these around town, not even at Reading Terminal. But they do look good even though I can't tell if they are more a glazed donut or sweet bun kinda thing..
You should try the ones at William Greenberg's on Madison in the 80's. I've been having them for almost 40 years. One of the best pastries out there. Ever. 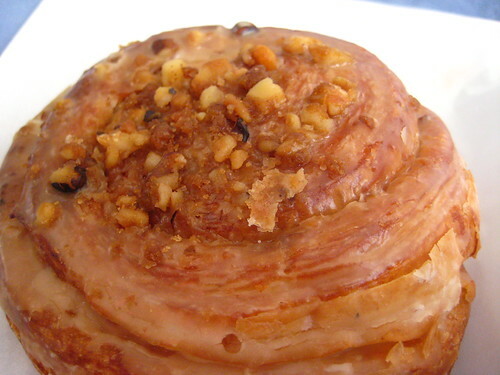 I can't help but think of Nathan Lane in the movie The Birdcage saying 'the schnecken beckons! '.